Working through a Seoul shopping story today, I came across some notes about a reproduction of a famous Korea story about a magpie and a tiger, from the Joseon period. 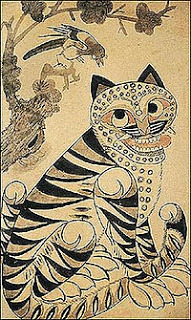 In mythology, the maggie is a bringer of news from the gods, and the tiger is said to bring blessings and exorcise disaster. I love the stylised tiger, with his big round eyes, and the fact a humble, plain magpie can be elevated to messenger of the gods. If you’re visit the Gyeongbokgung Palace, nip into the gift shop to see some great bags printed with these classic paintings. No doubt, here in Melbourne, fans of the Magpies (Collingwood) will be hoping the gods are on their side this weekend against the Saints for the AFL grand final!